Vintage Sewalong 2011 – decisions, decisions! 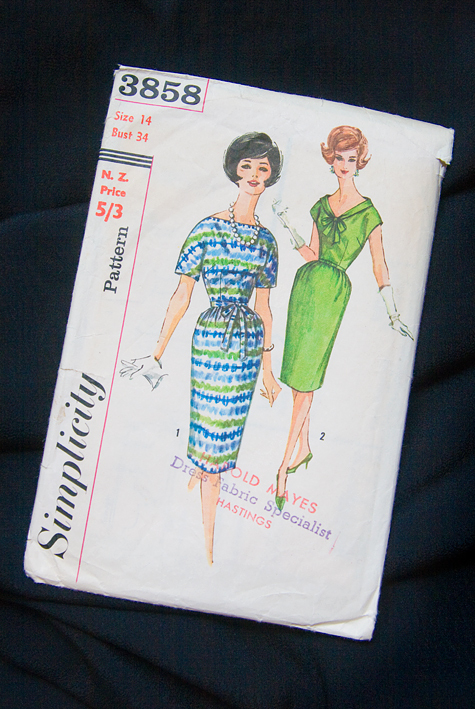 Have you come across the Vintage Sewalong 2011 in sewing blogland yet? ﻿﻿I promptly signed up, and now I’m in the process of deciding what to make. As usual I’m using stash fabrics, which is rather restricting, although I did have a considerable increase in available options recently…. I would copy the grey version exactly – I already have some charcoal linen and red topstitching thread. But it is such a basic shift, and I’d really like to make something more interesting for the sewalong. But I would wear it, because I practically live in shift dresses in summer, winter, autumn and spring! I would make this in some dark green wool, with black satin trim. But I’m not sure I would wear this confidently – I like the vintage-ness, but at my age you have to be a bit careful – can I go there without looking like Aunt Doris?! 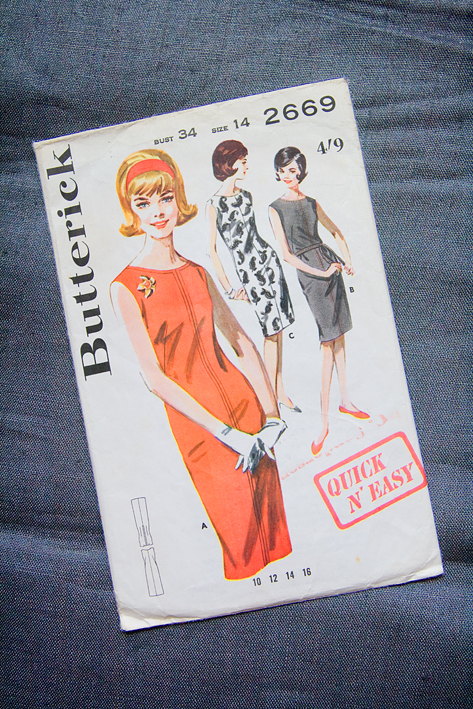 By the way, this pattern is from one of my latest acquisitions – a 1964 Burda – which I haven’t even posted about yet, I promise I will soon! This design could easily be bordering on naff, but in black viscose crepe could Version 2 be a cute LBD? The muffin-enhancing gathers could be a worry as I already have a fairly good muffin and am practically already peg-top without the skirt, but viscose has great drape … should I, or shouldn’t I? I’m not usually so undecided, but I find it so difficult to decide on some vintage designs – there is a fine line between looking decidedly frumpy, and looking like you are from another era! Do you find this too? And please – can you help me decide which one to sew for my Vintage Sewalong !? I love that second one. The other too are pretty, but the Burda.. I think it's really special and beautiful. I would love to see it in a version of yours! Personally I am very drawn to the last one – I really love the bow neckline! However, I think that all of them are fabulous and I know you will do any of them justice! I like the shift dress, it's got a vintage feel without being costume. Charcoal linen with red topstitching- hmmm, I might steal your idea! To me, the Burda is very Aunt Doris. I am in love with the Burda! Glad you are doing the sewalong too! I like the portrait collar on the last one – but I too am fond of a shift dress so that one would look great and be a classic in grey. I too like the neckline of the green dress (last one). Maybe the artist got carried away when drawing the waistline – my vote – the green one. I like your first idea, just like the pattern illustration on the envelope; charcoal grey with red top-stitching. This would be beautifully classic, modern enough without looking like one had raided Auntie Doris' hope chest. 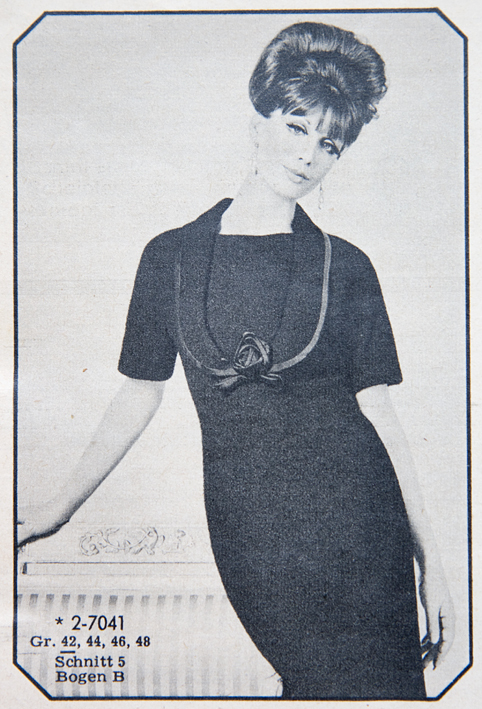 I'm partial to the Burda – that collar makes it really special. Bottom line – you have to make your own choice, because everyone has a different opinion – and you will eventually make all of them? I like the last one – it's cute! You sound as though you're not really sure you'd like to make *any* of these for the sewalong. Why not choose some other vintage pattern? I'd suggest something more mod with really interesting seamlines. 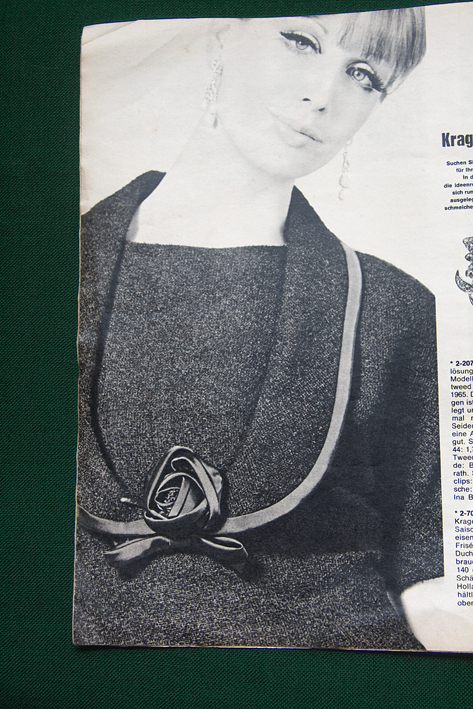 Maybe a vintage Vogue Original Designer pattern if you could find one? I like the green dress best! It would be lovely in black or any colour, the neckline is so fun! I find there's a fine line between looking pretty with a retro flair, and just plain costume-y. (Probably because I always choose full skirted styles, which can turn costume-y very quickly!) Styling your dress with awesome shoes and modern hair helps bring it into the right decade. I've heard of the sew-along, I just might join as well!